Of course one of my most vivid memories involves a meal. I ate crêpes with my “family,” not on the side of the road, but at a real crêperie. The rustic little restaurant had low ceilings and a large open front window. It couldn’t have sat more than 30. Its main sources of light were the evening sky and candles at the tables. My “sister,” young “brother,” and I ate sweet crêpes for dinner and drank potent (hard) cider out of bowls (when in France…). My crêpe involved poached pears, a slight drizzle of chocolate, toasted almonds, and crème fraîche. The siblings followed their respective sweet crêpes with ice cream–topped second rounds—what excess! But despite the novelty of having dessert for dinner, I envied the homey, hearty-looking galettes that the parents ordered. 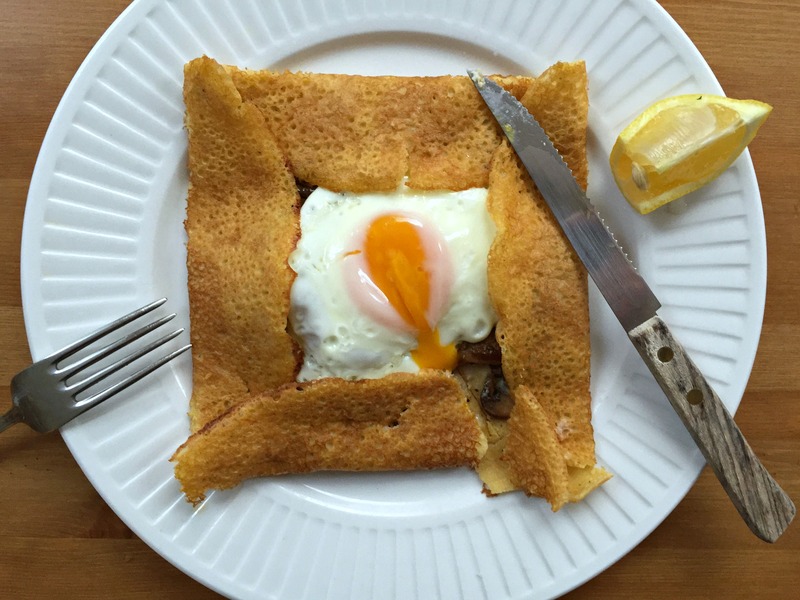 Darker, as they were made from nutty buckwheat, the lacy crêpes were folded into a square shape around ham, cheese, and egg, and veggie fillings. Proper dinner. To this day, I feel I missed out. To recapture that memory, I thought, I would conquer the filled buckwheat crêpe and get closer to my time in that quaint wine-producing town—to a time when I wasn’t a phony. And then, upon testing this recipe, I discovered I’m violently allergic to buckwheat. 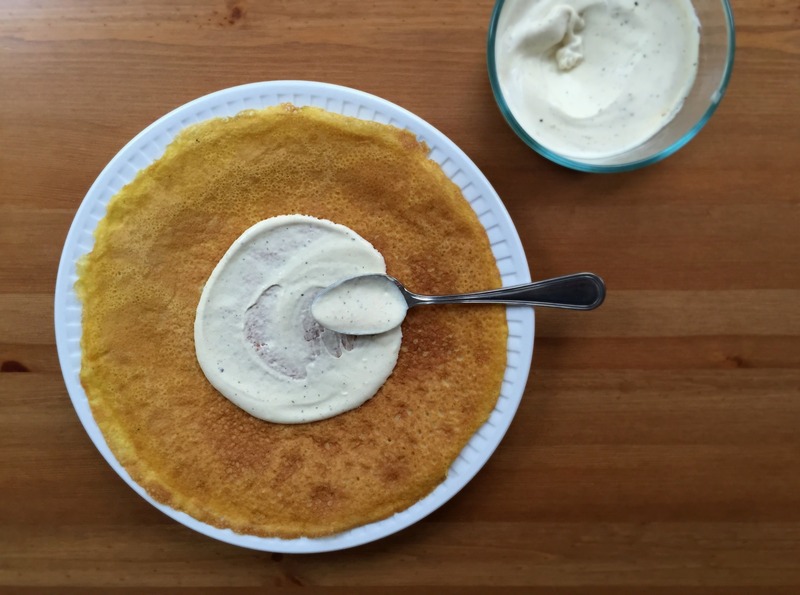 So here we have the same concept I was dreaming up for the buckwheat crêpes piled instead on savory chickpea crêpes, or socca, as they’re known in Southern France. 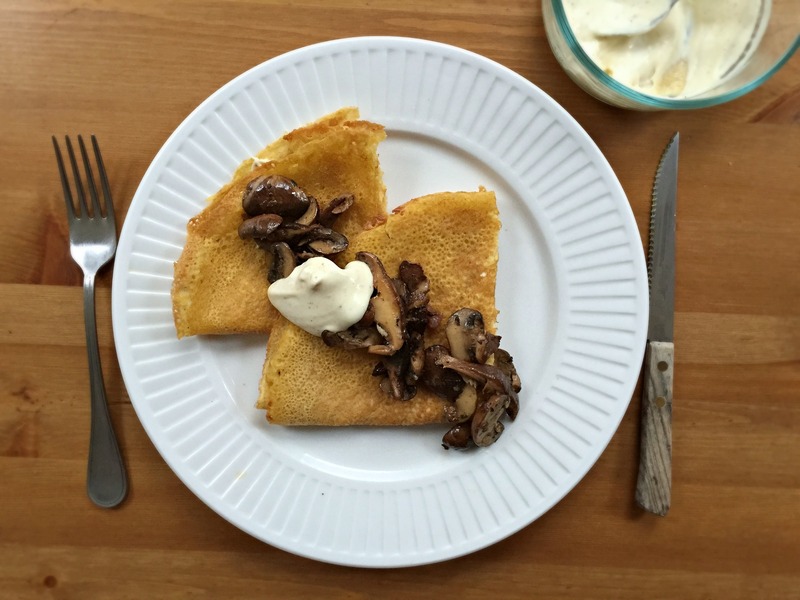 While not served as buckwheat crêpes typically are, chickpea crêpes are just as versatile and stand up well to bold, savory ingredients like mushrooms. And when the ratios are just right, they’re soft, foldable, and much more savory than white-flour crêpes or even spelt ones. Earthy and complex shiitake and crimini mushrooms, sautéed simply with thyme and shallot and finished with white wine, complement the also-earthy flavor of the crêpes. 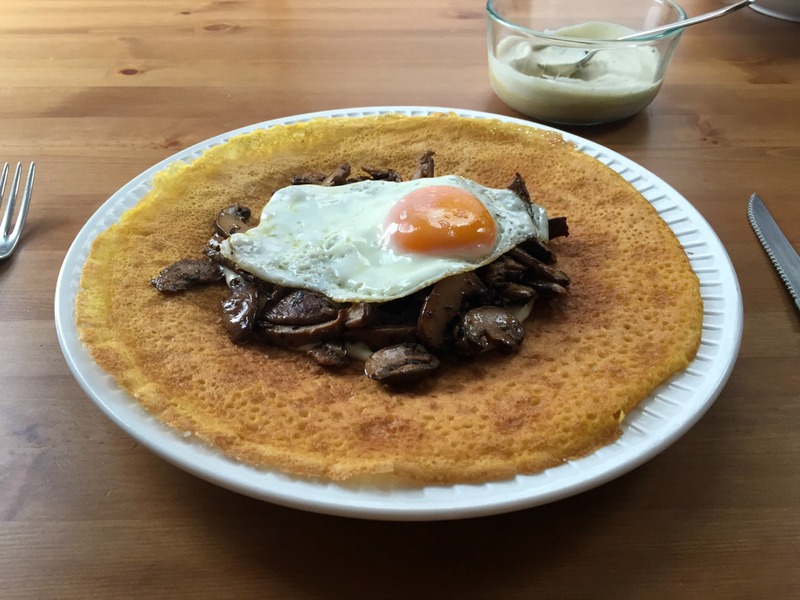 The mushrooms sit on a modest base of pepper- and Dijon mustard–enhanced crême fraîche, whose sharpness contrasts nicely with the rich fried egg topper that makes the galette a complete meal and whose yolk breaks to create a sauce. A final squeeze of lemon at the table adds welcome acidity. An inauthentic crêpe recipe doesn’t give me my Francophile card back, but it does remind me of a time that defined my youth, and that is enough reason to keep developing these recipes. I like to use a 4-ounce ladle to add the crêpe batter to the pan. Crêpe cooking times will vary with burner and broiler outputs; use visual cues. 1. For the Crêpes: Whisk chickpea flour, coriander, ¼ teaspoon salt, and pepper to taste together in medium bowl. Add water and whisk until completely smooth. Whisk in 1 tablespoon plus 1 teaspoon oil. Refrigerate batter for at least 2 hours or up to 12 hours. 2. Adjust oven rack 5 inches from broiler element. Heat broiler. Heat 1 teaspoon oil in 12-inch nonstick skillet over medium-high heat. Using pastry brush, brush bottom and sides of pan with oil. Add a scant 4 ounces (½ cup) to one side of skillet and quickly tilt and shake pan to distribute across pan bottom. Cook until edges just turn brown, about 30 seconds. Quickly loosen edges of crêpe with spatula and place skillet under broiler. Broil until top of crêpe looks dry, about 45 seconds (top will not brown). Loosen underneath crêpe with spatula and flip crêpe onto cutting board. Repeat process three more times, using 1 teaspoon oil to cook each crêpe and piling crêpes on top of each other and set aside. Wipe out skillet with paper towels and set aside. 3. For the filling: Heat oven to 250 degrees. Mix crème fraîche and mustard together in bowl. Season generously with pepper to taste; set aside. Heat oil in 12-inch sauté pan over medium-high heat until shimmering. Add mushrooms and ¾ teaspoon salt and stir to coat. Cook mushrooms, covered, stirring occasionally, until they are swimming in their own liquid, about 6 minutes. Remove cover and cook mushrooms, stirring occasionally, over high heat until liquid is just coating mushrooms, about 3 minutes. Add shallots and thyme and cook, stirring only occasionally, until liquid has completely evaporated and mushrooms are tender and begin to brown, about 4 minutes. Reduce heat to medium-high, add wine, and cook, scraping up browned bits on bottom of pan, until wine has evaporated, about 3 minutes. Stir in lemon juice. Transfer mushrooms to bowl. 4a. 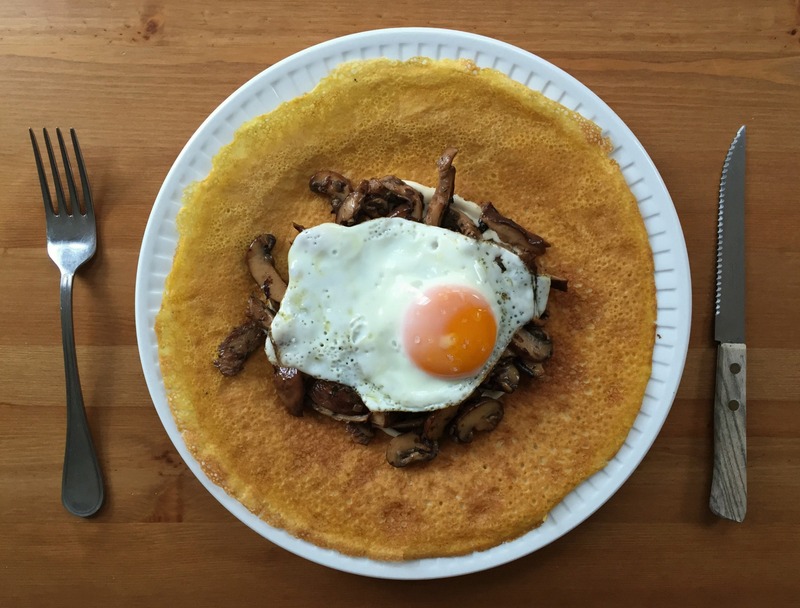 For open-face galettes: Place crêpe on plate, browned side up. Spread 2 tablespoons Dijon crème fraîche in circle in center of crêpe. Pile mushrooms on top of crème fraîche. Repeat with remaining crêpes. Transfer plates with galettes to 250-degree oven. Heat oil in nonstick skillet used to cook crêpes and fry eggs to desired doneness. Place 1 egg on each galette and serve immediately. 4b. For folded galettes: Place crêpes on plate, browned side down. Spread 2 tablespoons Dijon crème fraîche in circle in center of crêpe. Pile mushrooms on top of crème fraîche. Repeat with remaining crêpes. Transfer plates with galettes to 250-degree oven. Heat oil in nonstick skillet used to cook crêpes and fry eggs to desired doneness. Place 1 egg on each galette. Make 4 folds around egg to enclose mushrooms and serve immediately. Memories, especially ones you remember so vividly, make life almost seem magical, don’t they? These look fantastic. I would typically veer towards sweeter crepes instead of savory but I won’t be able to resist these! Love this! Oh, and the crêpes look grand, too.